4.0 out of 5 based on 68 bloggers and 24 commenters. 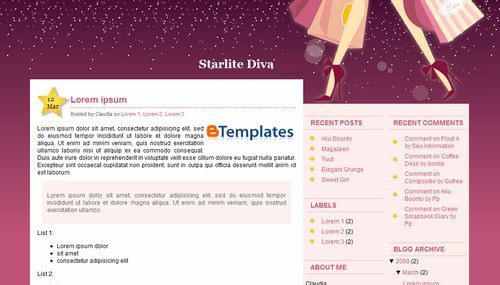 Starlite Diva is a free blogger template adapted from WordPress with 3 columns, right sidebar, girly looking and vectorial elements. Excellent template for blogs about fashion. I absolutely love this template and it’s SO perfect for my blog. I clicked on the download button though and it didn’t work. A pop up box appears like it’s asking if I want to open or save it, but it’s not the normal download box. It looks like something is missing? I love this template and it is perfect for my blog but when downloaded this to blogger.com it says “Please correct the error below, and submit your template again. XML error message: Content is not allowed in prolog.” how do i make it download correctly? Chewy: Just upload the xml file as the instructions says. Ensure you’re in new Blogger, not in Blogger Classic. Why in the star upper left hand corner of every post does it say undefined? 1. Change the post timestamp format (the hour) to the date today, for example: Thursday, March 12, 2009. Como quito el undefined de las estrellas? arreglé lo de la fecha en las entradas, pero no sirvió no lo supe hacer..ayudame por favor. I’m having the same problem as Chevy, how do I ensure that im in new blogger and not blogger classic?? Why are my headlines in spanish?? In my blog I couldn’t see the description. How can I fix that? I love this, but when I added it, the about me section moved over so it went right off the screen. How do I fix this? Also is there a way to change font colors? How exactly do you change the timestamp format to fix the ‘undefined’ thingy on the stars. I’m not all that good with HTML. love this template for my blog but the ” date undefined” thing is making me crazy.. the instruction says “1. Change the post timestamp format (the hour) to the date today, for example: Thursday, March 12, 2009.
where will i create an html widget? will i put it in sidebar what?? ..i did change the date: example: Thursday, March 12, 2009 but it’s still undefined..
Oh dear I finally get the date right..lol >>>> Settings /Formatting/ Timestamp format -> Friday, March 26, 2010 . Thanks for this cute template, just wished you had put a tagline.! Any possibility you can send me the complete html code? I’ve had two people try and help me download this template and it just isn’t working. I’m trying to design a new blog for someone and this is what they want. @Cynthia You don’t need the html code if you have a xml file. Please, read our FAQ section.